What is the past tense of Skydiving? Skydove sounds way wrong. Anyway, that is what we did for Mark’s birthday. 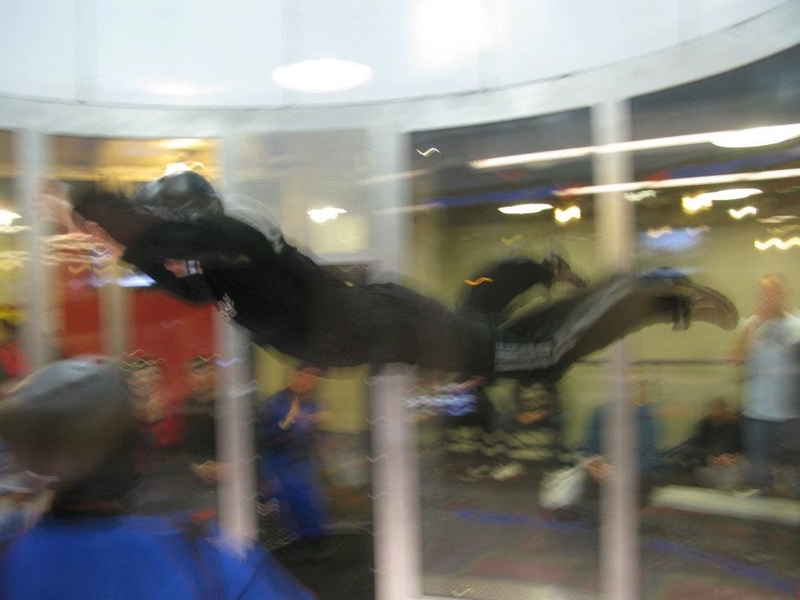 Before anyone freaks out, it was at iFly in Renton and was an indoor wind tunnel, so there was no jumping out of an airplane! Mark has been wanting to do this for a long time, and we had a blast! 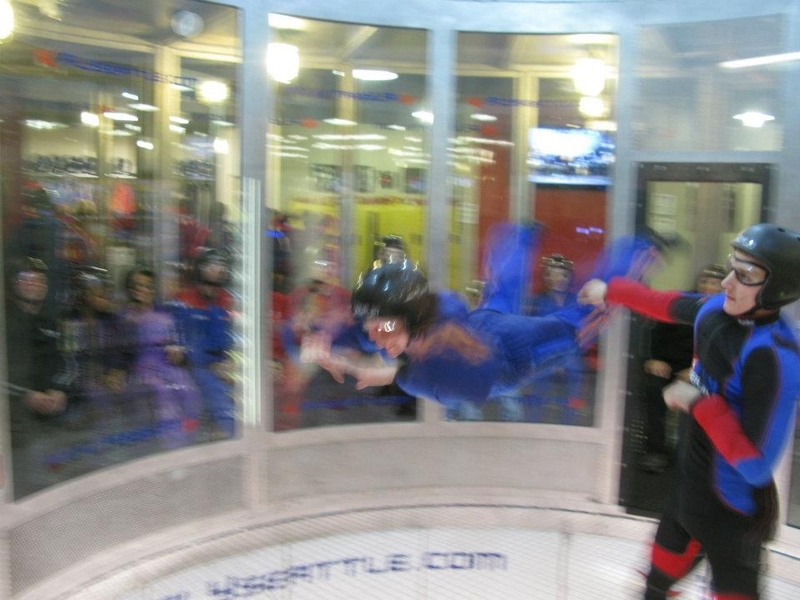 We each had two, one minute sessions in the wind tunnel, and we were all able to fly solo at different points. It is much harder than it looks to get the correct body position to “free fall”, and I was way sore the next day from holding my legs in the right spot. But, it was so much fun! Yesterday was his actual birthday and the three of us decided to check out a Korean BBQ in Lakewood, and it was amazing!!! We are very adventurous food people and I ate stuff like pork jowl, and other stuff I had never had before. The fun part was you get all your meat and sides and then you cook it yourself on the grill in the center of your table. We had so much fun trying all different combinations of yummy food. 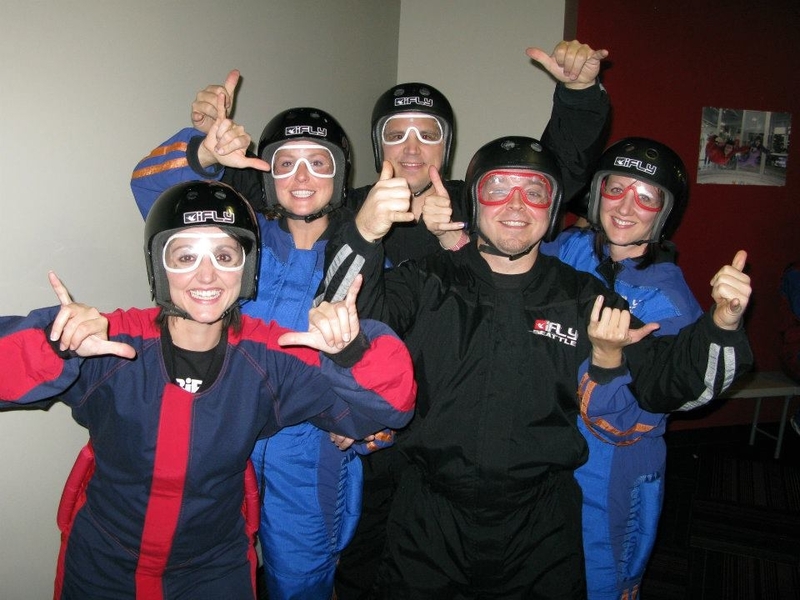 The staff was wonderful teaching us what to do and what everything was, they adored Sky, the price was great and we will totally go back! I highly recommend Cham Garden Korean BBQ! Me flying with the instructor keeping a hand on my leg so I don’t hit the wall. The wind speed when I was flying was around 98 to 100 MPH. Mark of course was good at it and lot’s of solo fly time. His wind speed was between 107 to 111 MPH. All of us geared up and ready to go. In the wind tunnel there is too much noise for the instructor to be able to talk to you so they use specific hand signals to communicate. This one means relax. Hold your position, but relax because stiff boards don’t fly.